Table - Where is the table from? Thanks! Can you let me know where the table is from? Was the booth built in or are there movable parts? Yes..love the table! - Who makes it? Is it custom? I would like to also ask again about the flooring? - Would appreciate color and manufacturers. I saw other questions about the floor but could not find a reply. Very pretty! Where can I purchase this table? - Also, what are the dimensions? Wood floor - Manufacturer please and thank you? Table/bench footprint - What are the dimensions of the table and the footprint of the table plus bench and chairs, please? Flowers? - Where are they from? Tile - What color tile did you use? Love the chairs. Where can I get them? 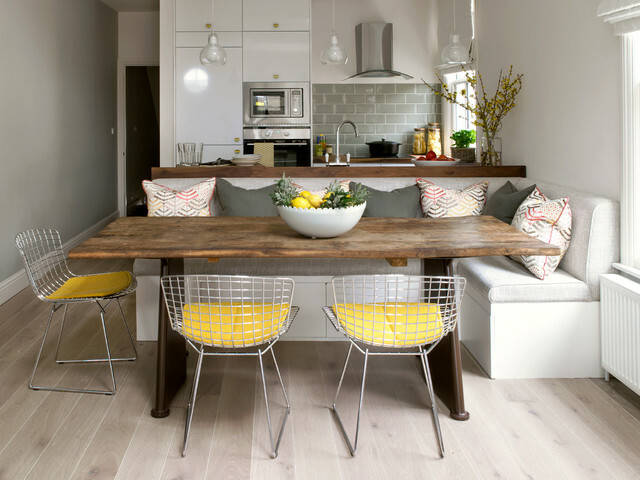 Small beach ranch kitchen - Where are the bench seats from? What type of flooring is this? Where is it from? What colour is the paint on the wall please? - What is the colour of the wall paint please? 6. Bertoia wire chair. Harry Bertoia’s wire chairs have an amazing lightness of structure and ability to add oodles of style to any kitchen or dining room. Oh, and they’re really comfy to boot.The Italian-born American furniture designer created just a single series of five wire chairs in the 1950s. This one, the Side chair, produced by Knoll, is an out-and-out classic. Interiors aficionados worldwide adore the delicate yet tough design, which comes in black, white, chrome and powder-coated colors and has neat snap-on seat pads. Tough vinyl pads on boldly colored powder-coated versions can also brighten up alfresco eating spaces. Keep it cozy. On the whole, people aren’t keen on hanging out in stark rooms. If your kitchen feels comfortable, it will draw people to it and make everyone in it feel at ease. Here, generous seating, an array of comfy cushions and a rustic wooden table with a big bowl of fruit help to give the room an inviting, lived-in feel. Create informal spaces. Deep-toned wood or dark painted floors lend themselves to quite formal spaces and luxurious furnishings. A light floor can have the opposite effect, toning down the formality and giving a casual feel. Segue from casual to formal. For a multipurpose booth that covers all your bases, pair an elegant dining table and chairs with casual bench seating, so you can dress it up for a grown-up dinner or keep it relaxed for a quick breakfast. Tip: Make sure the built-in seating is standard dining chair height—and factor in the height of any cushion that sits on top. 7. Build in a bench seat. Cushioned benches are comfortable and flexible. Make the most of an open-plan space by building one next to other elements in the room. Here, the bench rests against the kitchen countertop, creating a snug and sociable spot where guests can gather while the cook prepares food in the kitchen. Built-in table? Then bigger island?